Next-generation sequencing enabled T-cell receptor (TCR) repertoire analysis has gained major attention in scientific as well as clinically driven research. However, despite improvements of sequencing technology, next-generation sequencers produce huge data sets that are usually prone to errors, thus urging the need for improved analysis tools being able to account not only for the large number of sequences but also for sequencing artifacts. 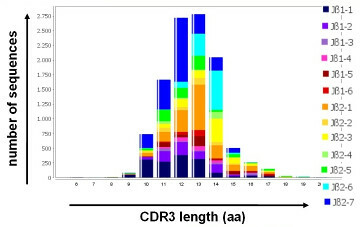 TCRProfiler is a tool that includes sequencer generated quality values to improve reliability of TCR repertoire analysis. As a stand alone tool for parallel and detailed analysis, TCRProfiler delimits combinatorial diversity (rearranged germline V, (D), and J genes) and junctional diversity (P(alindromic)-, and N(on-template)-nucleotides) of TCR alpha and/or beta chain sequences. TCRProfiler generates probe-specific statistical repertoire profiles, as well as visualization files to allow fast and comprehensive accession of repertoire diversity. In a single analysis TCRProfiler can process TCR alpha and/or beta chain sequences of any species based on user given reference sequences. TCRProfiler is a standalone Java application that processes TCR alpha and/or beta chain sequences in parallel (multi-threaded) or on a single CPU desktop computer. The manual page describes the usage of TCRProfiler. The tool itself and the corresponding visualization tool (TCRViz) can be downloaded in the download section, as well as small example files containing test data and result examples. Primer sequence to be used with the test data (a T-cell receptor beta chain sample) can be found in the example command-line call in the manual page (see section: Running TCRProfiler). TCRProfiler was developed by Pina Fanny Ida Krell, Bielefeld University. If the program was useful for you, please cite it in your work. For questions or bugreports please contact the developer.